Friday 17 February 2017 at LEVEL a public event featuring the work of Polish Artists Grzegorz Rogala and Joanne Krzyszton. Je sui la vie (I am life) is controlled by the movement of people and changing levels of light in a room. The image starts to aberrate, changing constantly in a fluid motion. Using the movement of the body (or a hand etc.) people control the speed of change and interfere with the image creating of colorful, abstract images. A painting that is never still and stops only where there is no life. A palimpsest is a manuscript page, either from a scroll or a book, from which the text has been scraped or washed off so that the page can be reused for another document. To create this installation, Joanna photographed images from the television screen. These are revealed and manipulated by people interacting with the installation. What results is a dangerous, violent, disaster-ridden world of mass media, real and fictional. With sweeping movements of the hand, people change the image and re-shape it according to what they want to appear – but with no control over what frame will appear next. This contemporary palimpsest is a kind of labyrinth that continues to grow as a result of the intervention of individuals. Watching the film footage we seldom realize that the transformation of static frames into a film occurs due to frequency oscillation of our brain. Moving images flow into our eyes and immediately go to the “past” in our memory. This is not the case when recording movement using the method of “slitscan”. Single vertical lines – equivalents of the moment of “now” or single frames of film, remains on the screen. By adding one line to the other, they give a visual testimony of passage of time. In front of our eyes “now” turns into the past that continues its existence as visual representation, so it is observable and can be referred to. If so, one can play with the moment of “now!” using time as interactive material. These very special features of the representation of time using “slitscan” caught my attention when designing interactive installation “La route Paris-Jura”. 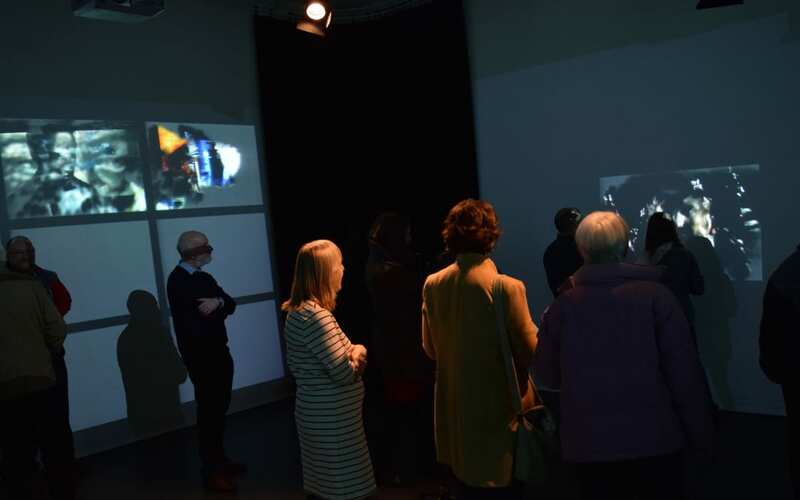 The very topic – centenary of travel of Duchamp, Picabia and Apollinaire from Paris to French Jura required a reference to the time passing, wandering, and above all, not restrained and available for each participant involvement in the spontaneous creative process, best described as electronic DADA. Installation I: Archipelago (2016) – a chain, cluster or collection of islands. The Archipelago installation requires 3D Glasses. Both Installations invite people to use their body and movement to create evolving and dissolving sculptural forms on a digital canvas. The reason for the creation of this installation was our desire to refer to the most fundamental human needs of leaving a visual trace, usually on the cave wall. In the case of this installation cave walls are created from Joanna’s abstract painting, thanks to the movements of the participant. “For us it is interesting to experiment with new spaces and audiences. We really need people to be active, so presenting at the Level Centre is an ideal environment – a place where engagement of participants is at the core of the art. Non verbal communication is important, the work requires involvement and interaction. 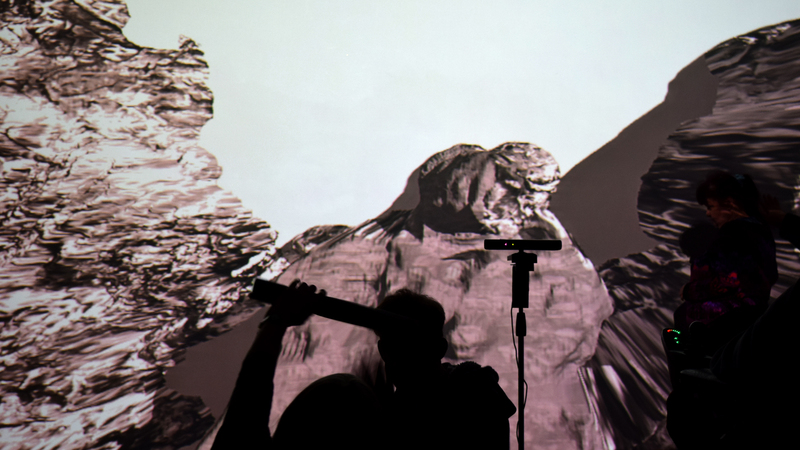 We want to investigate the universality of art, the universal language of forms and of music and explore the potential relationship between sound image and interaction.” Joanna Krzyszton. Grzegorz Rogala is an experimental film maker. His main interest is in computer art and 3D animation for interactive installations. Joanna Krzyszton is a painter. She creates both immersive abstract paintings and paintings derived from photography.